American sports fans love it when the good guys succeed. The case of Tim Tebow, the man who went from the most over-rated college quarterback to the most under-rated NFL quarterback in the space of a couple of months, proves as much. These successes also give divisive commentators like ESPN’s Skip Bayless the opportunity to eulogise over players and provoke debate amongst their twitter followers (although Bayless literally never replies to anyone’s tweets, so there seems little point in ever tweeting him). Bayless, among other commentators, has had cause to champion another good guy of late because these past few days have seen Harvard graduate Jeremy Lin take the NBA by storm. Lin, the first Taiwanese-American to play in the NBA, was a first-team all-state and Northern California Division II player of the year in high school, averaging 15 points, 7 assists, 6 rebounds and 5 steals per game. Upon graduating from high school, he sought recruitment by a number of Ivy League schools, but was only offered a place as a walk-on at UCLA. Ivy League schools do not offer scholarships, but Lin, who averaged a 4.2 GPA in high school (4.0 is more or less equivalent to an A), managed to secure a place at Harvard, although rumours that he attended the Cambridge, MA institution in the hope of working alongside future team manager, and Northern Ireland basketball icon, Mike Evans, remain unproven. An All-Ivy-League second teamer in his sophomore season, Lin was a consensus first-teamer by the end of his junior season; a unanimous selection by the time his senior season finished. As in high school, Lin had proven that although nothing about his game really stood out, he did have an ability to play in an incredibly effective manner, recording impressive averages across the statistical categories (in his senior year, for example, he managed a block a game). As a Harvard graduate, Lin’s NBA prospects were not particularly great. The last Harvard player to have made it to the NBA was Ed Smith…in 1954. He was invited to pre-draft workouts, but, as anyone who’s ever watched these workouts will know, these are not particularly geared towards exploring a player’s five-on-five capabilities, rather examining more measurable skills like shooting percentage, speed and overall fitness. Unsurprisingly, Lin went undrafted, but attended the NBA’s summer league where he played with the Dallas Mavericks team. In his pre-season debut, he arguably out-shone first overall pick John Wall and secured offers from a number of teams, eventually signing with the Golden State Warriors. In many ways, the Bay Area was the ideal starting point for Lin. It has a large Asian population and Lin’s replica jersey quickly became a top seller; Lin was also the second-most requested interviewee on the Warriors roster after Stephen Curry. During his rookie campaign, Warriors coach Keith Smart implemented a rule that no foul on Lin in practice would be called; his reasoning that a rookie player could not expect any favours from the referees. This taught Lin to play through aggressive defence, the likes of which he would have experienced only sporadically at college level. He spent a fair amount of time in his rookie season at the NBDL Reno Bighorns and, although averaging a not-too-shabby 2.6 PPG on nearly 39% shooting, he was waived just as the lockout ended on 9th December 2011. Lin spent three days without a team before being picked up by the Houston Rockets, but twelve days later he was back on waivers as the Rockets cleared space to sign big man Samuel Dalembert. Again, it was only three days before Lin was picked up again, this time by the New York Knicks who, having spent way too much on Amare Stoudemire’s knees and Carmelo Anthony’s sticky hands, were seeking further, relatively cheap, back-up options. Although being signed as a back-up to Mike Bibby could be interpreted as a gross insult to many of us, particularly after Lin was again assigned to the D-League, Lin continued to work hard, exemplified in his 28 point, 11 board, 12 assist triple-double on 20 January. He was quickly recalled to the Knicks roster. Lin: the most interesting thing about New York basketball? On 4 February, Lin exploded for 25 points in the Knicks win over the New Jersey Nets. The following game, against the Utah Jazz, Lin poured in 28 points along with 8 assists. Then, against the Washington Wizards, Lin scored 23, including a dunk after he had crossed John Wall that had you saying “wow, I didn’t know he could jump” and “so I guess the concept of help defence just doesn’t exist in Washington” simultaneously. The 109 points in his first four starts is the most by any player since the 1976-77 merger of the NBA and ABA. 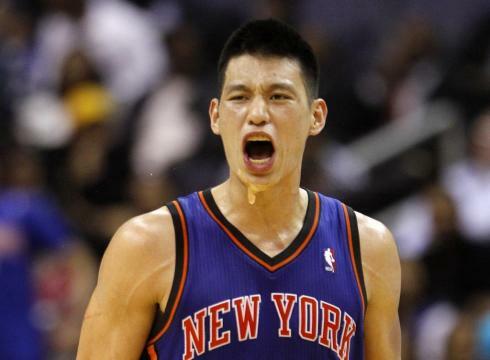 If you love sports, you have to love what Jeremy Lin is doing. Getting an opportunity and exploding!! Lin then had a humungous 38 points against the Los Angeles Lakers, outscoring Kobe Bryant by four. Significantly, his team won and Lin’s seven assists was actually more than the entire LA starting five managed between them. Perhaps his greatest achievement, however, is becoming the first New York Knick to actually exceed expectations. Sanders you should send this stuff to ESPN and get yourself a job as a columnist! You are legit! Thanks lads. Coming soon…a piece on the one and only Michael Calo.